Despite record highs on Wall Street this week, investors and economists are not worry free. Many point to similarities between today's market and the conditions preceding the Stock Market crash of '29. 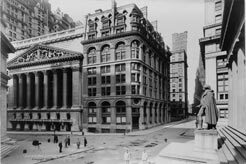 "Your predecessors, over at the Senate Banking Committee, in the celebrated Pecora Hearings of 1933 and 1934, laid the groundwork for the modern edifice of financial regulation. I suspect that they would be appalled at the parallels between the systemic risks of the 1920s and many of the modern practices that have been permitted to seep back in to our financial markets." "Markets don't regulate themselves, cleary, anymore than you can have an intersection and no stop signs and red light." Robert Kuttner is co-founder and co-editor of THE AMERICAN PROSPECT, writing regularly for the magazine on economic and political issues. Most recently, he is the author of THE SQUANDERING OF AMERICA: HOW THE FAILURE OF OUR POLITICS UNDERMINES OUR PROSPERITY, on the connection between political and economic inequality and impending risks facing the economy. Mr. Kuttner has written six previous books: EVERYTHING FOR SALE: THE VIRTUES AND LIMITS OF MARKETS (1997); THE END OF LAISSEZ-FAIRE (1991); THE LIFE OF THE PARTY (1987); THE ECONOMIC ILLUSION (1984); REVOLT OF THE HAVES (1980); and FAMILY RE-UNION (2002), which co-authored with his late wife, Sharland Trotter. He writes a syndicated weekly column for THE BOSTON GLOBE and has contributed to THE NEW YORK TIMES MAGAZINE and THE NEW YORK TIMES BOOK REVIEW, THE ATLANTIC, THE NEW REPUBLIC, THE NEW YORKER, DISSENT, and BUSINESS WEEK. He is one of five co-founders of the Economic Policy Institute, and serves on its board. He was the 1996 winner of the Paul Hoffman Award for Human Development of the United Nations, for his work on the relationship of economic efficiency to social equality. His book EVERYTHING FOR SALE was the 1997 winner of the Sidney Hillman Award. William H. Donaldson was the 27th Chairman of the U.S. Securities and Exchange Commission, beginning in February 2003 and eventually stepping down in June 2005. Before arriving at the SEC, Donaldson served as the Chairman and CEO of the investment banking firm DLufkin & Jenrette, which he co-founded; Chairman and CEO of the New York Stock Exchange; Chairman, President and CEO of Aetna; and Chairman and CEO of Donaldson Enterprises, a private investment firm, which he has since returned to after leaving the Commission. In the late 70's, Mr. Donaldson co-founded the Yale University School of Management, serving as the school's first dean and professor of management studies. His government service spans five presidential administrations and includes serving as Under Secretary of State to then Secretary of State Henry Kissinger, and Counsel and Special Adviser to Vice President Nelson Rockefeller. Mr. Donaldson is a Marine Corps Veteran, a graduate of Yale University, and Harvard University School of Business where he received an MBA with Distinction. Financial columnist Gretchen Morgenson on the SEC, the mortgage crisis and other matters fiscal, June 29, 2007. Hedge funds are private investment funds offering a way for people to invest money in stocks, bonds, short-term money market instruments, and/or other securities in order to make investments that may not be feasible for an individual investor. They usually generate higher total returns for their investors versus mutual funds by "hedging" against downturns in the market. Derivatives are investments that derive their value from something else, such as stock options that trade based on the price of an underlying stock. Derivatives have long been a favorite tool for hedge funds. From the SEC Web site, explore the tutorial entitled, "Hedging Your Bets: A Heads Up on Hedge Funds and Funds of Hedge Funds." The International Finance and Development Center at the University of Iowa has put together a handy primer on the history of hedge funds and important facts about modern hedge funds and investment firms. The Investment Company Institute explains the differences between hedge funds and mutual funds, in terms of fees, regulatory requirements, leveraging practices, and more. "Is there a way to get above-market returns on the cheap?" NEW YORK magazine has put together a primer on what we all should know about hedge funds. Timothy F. Geithner, President and CEO of the Federal Reserve Bank of NY, discusses hedge funds and derivatives 10 years after the financial crises of 1997-1999. "Corporate America is braced for the worst period of economic uncertainty since the start of the decade as the credit squeeze and the housing meltdown heighten the risk of a US slowdown." Historically, October has been the month for big financial busts. But this year, October could come early. Has deregulation left the economy at risk of another 1929-scale crash? Should the Fed keep bailing out speculators? Robert Kuttner testified yesterday before the House Financial Services Committee. For more than two decades, the Federal Reserve has been the prime enabler of a dangerously speculative economy. If we dodge this bullet without addressing the deeper threats, there will be more bullets to come. Robert Kuttner is one of five co-founders of the Economic Policy Institute, and serves on its board. William H. Donaldson was the 27th Chairman of the U.S. Securities and Exchange Commission, beginning his term in February 2003 and eventually stepping down in June 2005. Mr. Donaldson before the Senate Committee on Banking, Housing and Urban Affairs on hedge funds, April 10, 2003. William Donaldson speaks at the National Press Club about corporate governance, one year after the Sarbanes-Oxley Act. Man in the News; A Wall Street Insider for the S.E.C. "By appointing William H. Donaldson to succeed the traumatized Harvey L. Pitt as chairman of the Securities and Exchange Commission, President Bush has opted for a time-tested hand with some of the tightest Bush family links that Wall Street has to offer. And Wall Street is applauding the move." Veteran market watcher Robert Kuttner and Wall Street insider William H. Donaldson give their read of the current economic landscape and discuss the risks of the deregulation of the financial industry. Bill Moyers talks to Professor Anouar Majid about the diversity in the American tradition and its implications for Muslim society. A Bill Moyers essay on recent Nobel Prize in Literature recipient, Doris Lessing.